Buy Violife Dairy Free Alternative to Cheese Smoked Slices - 200g in the UK from our online shop or directly from our independent Scottish store. Try it in your everyday snack or melted on a toast and luxuriate in its "fuming" flavour. Or just enjoy it raw with fresh grapes and a glass of red wine! We sell real Violife and other Dairy Free Cheese directly from our shop in Scotland and online throughout the UK. View more products from Violife. Where can you buy real Violife Smoked Slices safely online? If you are wondering where you can buy Violife Dairy Free Alternative to Cheese Smoked Slices - 200g safely online in the UK, then shop with us. 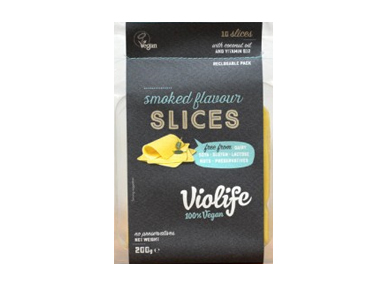 Violife Smoked Slices - Violife Dairy Free Alternative to Cheese Smoked Slices - 200g in Dairy Free Cheese and Chilled Foods.